In January this year, PokerStars was the first poker site who got the license to share Spanish and French players pool. After just a couple of months, merging showed up as a great business idea. Much better tournaments with doubled guarantees, a whole lot more players on cash games, full SNG lobbies, non-stop action on Spin ‘n’ Goes is what made players way more satisfied. Not only the true poker lovers, but many players from casino games are now participating since there is lots of that going on. At the time the plan was on the table there were two more countries besides Spain and France who agreed to a liquidity sharing deal – Portugal and Italy. After taking a while Portugal is finally in! They ‘ve just joined at the end of May this year. It brought even more benefits for both players and PokerStars leadership. “We have worked hard to become the first operator to bring the benefits of shared liquidity to Portugal. Our players will see a huge increase in the variety and scale of our tournaments and promotions. They will enjoy more excitement, more competition, and more fun. This dramatically strengthens our offering and demonstrates our commitment to the Portuguese market. We look forward to working with the Portuguese regulator to further improve the poker product offering for Portuguese players. Additionally, we hope that Italy will soon progress so that their players can also enjoy the significantly better experience that shared liquidity brings.” Templer finished. We believe that players also impatiently wait for Italy to join because there is no doubt it will be another great win-win move. We are witnesses that partypoker is working very hard to have their players more and more satisfied. Great cashback, promotions, bonuses, great VIP system is not only they are doing. Another proof of their commitment is that they are ready to “steal” the idea from another site. So, 4 months after PokerStars merged the player pools in Spain and France, partypoker did the same. They are already enjoying the benefits! The number of MTT scheduled tournaments is more than doubled and there is a great action on cash games. 888 poker and Winamax are also considering sharing the liquidity. However, 888 still doesn’t have a legal license in Portugal. That is probably something on what their team is going to work on in the following months. We can say that definitely is something good going on in the poker world. partypoker and PokerStars showed their will about making global markets, especially PokerStars since they have let even players from the other countries to play on their pokerstars.es site. It would be great if all other networks do the same. After that, we are waiting for USA market do join the rest of the world! Could all of this be a good sign that moment is getting near? 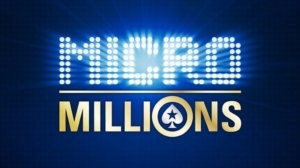 The 14th MicroMillions series will not only bring great MTT tournaments available for everyone’s bankroll, but there will be some following promotions and prizes that you can win. If you play at least 5 events of these series you will get a ticket and automatically be entered to an All-in Shootout tournament which will take place on July 31st. Good news is that you don’t even need to be online and logged in to your Stars account to participate. First 2 places will get a $30.000 Platinum Passes – $25.000 seat in January’s PokerStars Players No Limit Hold’em Championship (PSPC) and $5.000 hotel and traveling expenses. 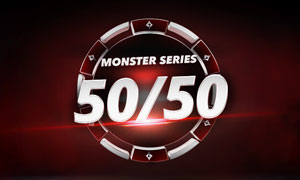 During the series, PokerStars will be giving away $50.000 in free tickets for some tournaments of this event. You just need to play their events. Whole separated MicroMillions event will take a place at Pokerstars’s shared pool between Spain, France, and Portugal, where players from other countries can also take apart! You can find tournaments from €0.50 to €50 and the whole event has a prize pool of $2.000.000 guaranteed. The Main Event will be with €50 buy-in and is scheduled for July 29th. Join PokerStars today and win your share! 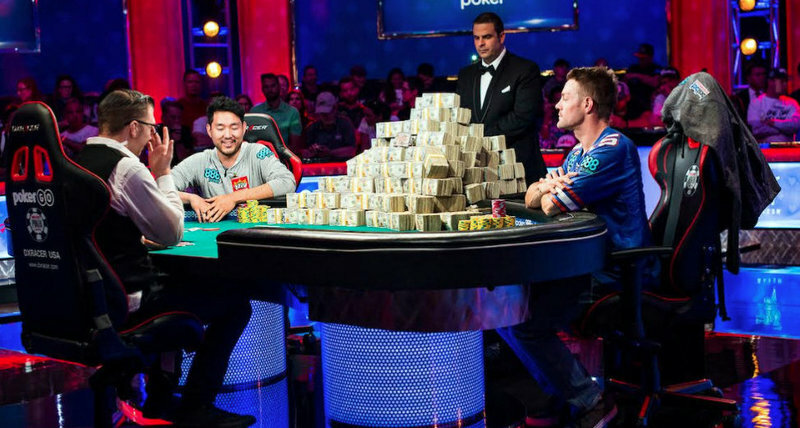 The most prestigious poker tournament, World Series of Poker Main Event, came to an end! This year champion is John Cynn, 33-years old from Indianapolis. After 10 days of fight in the last two weeks, he managed to win the bracelet. 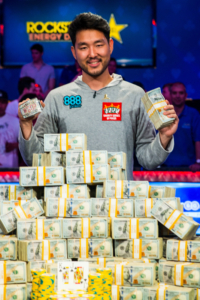 Defeating a field of 7.874 players turned his $10.000 into a fantastic $8.8 million dollars! Just to remind, this is not his first significant score on WSOP Main Event. 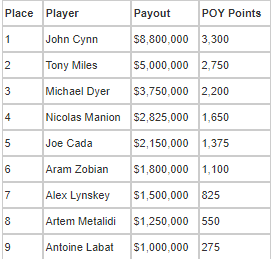 In 2016, John Cynn was out 11th, just before the final table, and collected a reward of $650.000. Heads up began with both players having the similar stack (119bb), Miles had a bit more chips. On the final hand John Cynn opened with K J , Miles 3bet him with Q 8 . The flop came: K K 5 . Miles made a continuation bet and Cynn just called. The turn brought 8 and Miles pushed all-in. After thinking for a while Joh Cynn made a call which got him a first place cash prize and most prestigious bracelet in the poker world. The runner-up Tony Miles won $5 million! 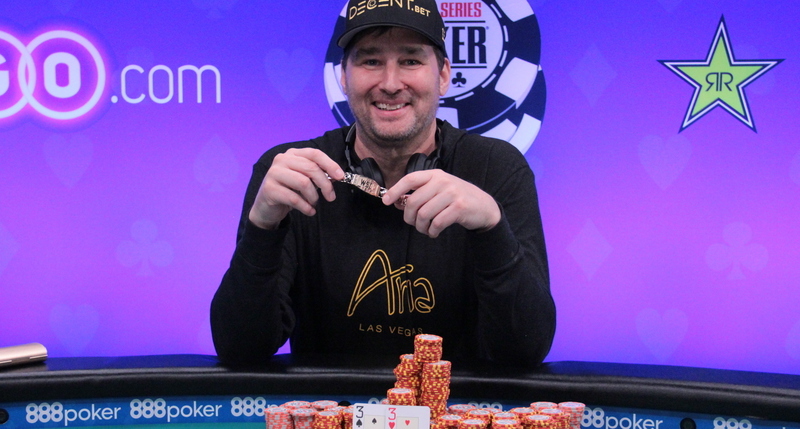 Phil Hellmuth won his 15th gold bracelet in 2018 WSOP! This time he is the winner of $5.000 Turbo No-Limit Holdem Event! Can anything stop this man from winning titles on the WSOP? Phil Hellmuth, the legend himself! To remind, Hellmuth recently released a book “#POSITIVITY” for which he got an inspiration after realizing how huge influence he has on fans. “The spotlight that I have becomes a responsibility. Once I realized that I could inspire people, I took that seriously”, said Hellmuth. As he admits, Phill didn’t have a good period for some time: “It’s humbling. I haven’t had a very good summer, but I’ve kept myself positive. Every night I come back to the room, saying, ‘Life is good, relax. Life is good, relax.’ Before this tournament, I called my wife and said, ‘Honey, I’m not sure I want to play this event. She said, ‘Get in there in play.’” And he did, and he did win a 15th bracelet and $450.000! His place on the final table of $5000 Turbo No-Limit Holdem Event also found Steven Wolansky, a two-time bracelet winner. He even managed to knock out 3 players from the final table, and reach heads up with 3 to 1 lead against Hellmuth, but that wasn’t enough… Maybe the major hand was when both players moved all-in preflop, Hellmuth with K 10 and Wolansky with K J . Ten on the river brought Hellmuth a huge pot and a chip lead. Just a few hands after that Steven Wolansky pushed all-in from the button with A 9 and Hellmuth called with 3 3 . Flop brought a 9 for Wolansky bout also a 3 for Hellmuth. After the blank turn and river, Phill scored another win while Wolansky won $299.907 as the runner-up finisher. Some people admire Phil and some, from the other side, have a negative opinion about him. However, like him or not, he is definitely a legend and he is definitely still around! Partypoker continues with hosting a massive tournaments events for everyone’s bankroll! This time on the menu is the 8-day $2.1M Gtd Monster Series, starting on 29th July and ending on 5th August. There are awesome side promotions which follow the whole event! With tiny buy-ins, you will get a chance to win a share from a Monster guarantees! Each numbered event is at one of the three distinct tournaments – Low, Medium, High – offering buy-ins from just $1.50, up to $33. There will be a range of formats for you to enjoy, such as PKO (Progressive Knock-Out tournaments) where you win a prize for every player you eliminate, PLO tournaments, 6-max tournaments, etc. Also, there is one tournament scheduled for Ladies only. On the final day of the Monster Series cards will be in the air for the Championship Event, starting at 19.00 CET, 5th August. Prizepool for this main event comes with a guarantee of $200.000! 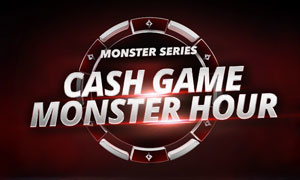 Join cash or fastforward tables during the Monster Hour to earn double Cashback Points. As the name suggests, you have a 50% chance of winning a prize ticket. The value of the ticket ranges from $1.50 all the way up to $33! Keep an eye on Partypoker’s Facebook and Twitter pages, they will reveal the time you need to log in to discover whether you have won the prize. Enter 10 or more Monster Series tournaments for the chance ato win share of $5K in MILLIONS Online satellite tickets. Once you achieve this then you’ll have a chance to win a random prize draw. Prizes are made of $5.50, $22 or even $109 tickets! You don’t have Partypoker account yet? Check out on our site more benefits you can get from this poker room and sign up today to enjoy coming promotions! The first ever partypoker MILLIONS Germany is to take place next February with a €8,000,000 guarantee event at the celebrated King’s Casino in Rozvadov. partypoker MILLIONS Germany, which runs 10th February to 18th February, is the last MILLIONS event of partypoker LIVE’s first season. It takes place just two months before the Grand Final in Barcelona in April. So far, partypoker MILLIONS has hosted highly successful events in the UK, North America and Russia. The $10,000,000 guarantee Caribbean Poker Party which starts on Friday in Punta Cana. Satellites for partypoker MILLIONS Germany kicked off on Sunday 19th November. With players able to win packages for the €5,000,000 guarantee Main Event from as little as $0.01. Players can buy in to any stage of the qualification path, including the weekly $1,050 finals which come with ten $7,000 packages guaranteed. The prize package includes the €5,300 partypoker MILLIONS Main Event buy-in plus $750 spending money. Following the popular formula pioneered for all partypoker LIVE events, there will be multiple Day 1s for partypoker MILLIONS Germany – both online and live at Kings Casino. Players who win their seats online will be able to choose between any of the live Day 1s. Furthermore, can even use their prize to buy into Day 2. Players can also enter as many Day 1s as they like with their largest stack being carried through to Day 2. Kings Casino is no stranger to major poker tournaments. This year alone, has hosted three prestigious partypoker events. This includes: partypoker Grand Prix Germany in May, the hugely successful partypoker Million Germany tournament in June, and the partypoker German Poker Championships in August. At the partypoker Million event in June, Czech player Michal Mrakeš won €200,000. Impressively, after beating an 820-entry field in the $1,000,000 guarantee Main Event. Partypoker sponsored pro Natalia Breviglieri also made the final, finishing sixth for €32,500. Finally, fellow sponsored pro Anatoly Filatov won the €2,000 High Roller for €64,125. King’s Casino, on the Czech border – two hours’ drive from Munich and Prague, boasts Europe’s largest dedicated poker room. Boasting 40 standard tables and capacity to seat more than 1,000 players for major events. The Casino also has a thriving cash game scene with tables open 24/7. partypoker MILLIONS Germany heralds the start of a very exciting year for the partypoker MILLIONS tour. With stops in North America, the UK and Europe already on the schedule. There are new stops in Barcelona and Prague. partypoker today announced its exciting schedule for the 2018 partypoker MILLIONS series with events in North America, Russia, the Caribbean and Europe as well as online. Overall, the series will be offering over $100,000,000 in guaranteed prize pools between now and December 2018. This includes the forthcoming Caribbean Poker Party in Punta Cana in November. Since its launch, partypoker MILLIONS has made its mark as one of the biggest and most successful poker series ever held. With record breaking prize pool guarantees and countless ways to qualify online for very small buy-ins. MILLIONS events have proved a massive hit across the globe. For 2018, partypoker is ramping up MILLIONS even more. All next year’s events will have guaranteed prize pools of at least $5,000,000! 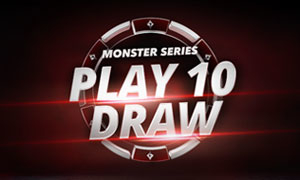 With five events each guaranteeing a minimum of $10,000,000 in total guaranteed prize money. At the $10,000,000 guarantee stops, at least three players will become instant millionaires.! With the winner banking a life-changing $1.4 million. The runner-up and third-place finisher will take home $1.2 million and $1 million respectively, and at least 250 players will be paid, with a minimum payout of €10,000. Next year’s MILLIONS schedule includes new stops at Casino Barcelona. As well as return visits to Kings Casino in the Czech Republic, Playground Poker Club in Canada, Sochi in Russia and Dusk Till Dawn in the UK along with a brand new venue for the Caribbean Poker Party. There are many ways for players to win their live event seats next year. With multi-phase online satellites starting from as little as $1.10. There will also be multiple Day 1s for all events – both online and live. Closing 2017 will be MILLIONS Online held on partypoker with a $5,000,000 guarantee. The online multi day event will run from December 3rd-6th with a $5,300 buy-in. Satellites for the MILLIONS Online Main Event start on Wednesday, November 1st and will run for over a month, right up until the start of Day 1a on December 3rd. The first 200 players to qualify will be automatically entered into a Last Longer competition which will award the winner with a $15,000 package to the MILLIONS Grand Final Barcelona next April. The first MILLIONS event of 2018 will be partypoker MILLIONS Germany at the celebrated King’s Casino in Rozvadov on the Czech border. Taking place from February 10th to 18th, the event will boast a €5,000,000 guarantee – a massive increase on this year’s €1,000,000 event which attracted 820 entries. The partypoker LIVE season 1 ends with partypoker MILLIONS making a debut stop in Spain with the €10,000 buy-in, €10,000,000 guarantee MILLIONS Grand Final taking place at Casino Barcelona from April 7th to 15th. This will be the first event of the year to see at least three players become instant millionaires. Barcelona is one of the Europe’s most popular poker destinations with a wide range of great beachfront restaurants, bars and clubs right on Casino Barcelona’s doorstep at Port Olimpic. Season 2 of partypoker LIVE kicks off with partypoker MILLIONS in April. With a return visit to Montreal’s famous Playground Poker Club. Partypoker MILLIONS North America made history in 2017. Generating Canada’s largest ever prizepool in a live poker tournament, attracting well over a thousand entries. The 2018 event, which runs April 21st – 29th,will see the prizepool guarantee doubled to $10,000,000 CAD. Three-phase satellites for the $5,300 CAD buy-in event are already underway, starting from as little as $1.10. The first Mega Satellite final takes place on October 1st . Winners receive a $5,300 CAD Day 1 Seat along with $700 USD for expenses. partypoker MILLIONS exploded onto the Russian poker scene on its record-breaking debut visit to Sochi in March this year. With 1,170 entries for the $1,000,000 guarantee event in Russia. The $5,000,000 guaranteed MILLIONS main event also broke records when it returned in September for the largest event in CIS history with 999 players, one away from hitting the enormous guarantee. In 2018, partypoker LIVE returns to Sochi for another $5,000,000 guaranteed prizepool at Russia’s popular all-year-round resort. The event will run from August 4th to 12th. Next year’s partypoker MILLIONS UK event is taking place at the famous Dusk Till Dawn club. Held in Nottingham from September 29th to October 9th. Following a highly successful event this year, the event returns with a prizepool of £5,000,000 (approx. $6,500,000 USD*). 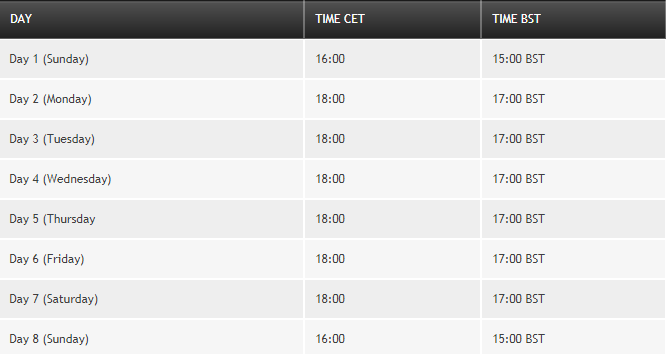 The full partypoker LIVE schedule including Grand Prix’s and other exciting will be announced soon. partypoker today announced that it will be hosting the first ever online version of its popular MILLIONS event with a $5,000,000 guaranteed tournament in December. The MILLIONS Online Main Event – which promises a $1,000,000 payday for the champion – will take place on partypoker.com from Sunday, December 3rd to Wednesday, December 6th. Players will be able to qualify for the $5,300 buy-in event for as little as $1.10 – or buy-in direct on partypoker.com. There are three start flights to choose from: Day 1a starts at 17.00 GMT (18:00 CET) on December 3rd with Day 1b starting at the same time on December 4th. There is a last chance Day 1c Turbo at noon GMT (13:00 CET) on December 5th with Day 2 also starting on the 5that17.00 GMT (18:00 CET). The final table is at 19.00 on December 6th. Players will begin Day 1 with a starting stack of a million chips with 30 minute levels. Satellites for the MILLIONS Online Main Event start on Wednesday, November 1st and will run for over a month, right up until the start of Day 1a on December 3rd. The first 100 players to qualify will be automatically entered into a Last Longer competition which will award the winner with a $15,000 package to the MILLIONS Grand Final Barcelona next April. All players who qualify for the Last Longer will have a Gold Chip icon against their avatar on the client and their usernames will be listed on the partypoker website. Satellites for the MILLIONS Online Main Event will be easy to find, coloured gold in the partypoker client under the ‘MILLIONS Online’ tournaments tab. The MILLIONS Online Main Event forms part of the partypoker MILLIONS series which launched in Canada earlier this year. Since then, partypoker MILLIONS has made its mark as one of the biggest and most successful poker series ever held, with live events across the globe including North America, Russia and Europe. The eagerly-awaited Caribbean Poker Party takes place in Punta Cana next month. This year’s partypoker MILLIONS champions have included Maria Lampropulos who won £1,000,000 after winning partypoker MILLIONS Dusk Till Dawn in the UK and Jean-Pascal Savard who beat a 1,168-entry field to take down partypoker MILLIONS North America for $CAD 956,000. See the MILLIONS Online webpage for further details.